The key to human & synthetic wig care is know-how and the right products. This can make your wigs & hair pieces look great longer. Love your hair & it will love you back! Here are tips to help guide cleansing, conditioning and styling. Human hair wigs and synthetic hair wigs each have special needs in order to maintain their optimal look and feel. Wigs, hair extensions & hair pieces made from human hair or synthetic hair endure intense chemical processing during production. Prolonging that supple movement crucial to a natural look is a must! To keep your wearable hair in tip top shape, you must use specially formulated hair care product designed to accommodate whichever fiber you are wearing or working with. There is no need to cleanse daily, but there are other steps necessary before or after each wear. Watch our video on How to Wash a Wig like an Expert. The simple tips and techniques outlined here can make all the difference! While a regular gentle shampoo might seem like a good idea, you'll be MUCH better off with a product custom designed to meet the needs of highly processed hair. You'll protect your investment and keep your hair looking terrific. Unlike most wig care products, BeautiMark is it is free of toxic parabens. The BeautiMark Pure Care line, specially formulated for human hair, contains no color-stripping sulfates. Wig Expert Tip: If you are new to wearing hair, consider a kit that will outfit you with all that you need. 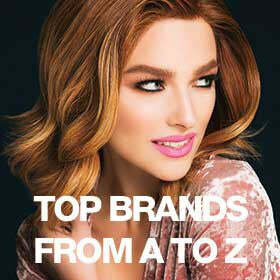 Wigs.com loves the BeautiMark collection formulated specifically for wearable hair and free of parabens. Wig Expert Tip: If you fall in love with a human hair or heat-friendly synthetic hair wig consider getting two. You can avoid overtaxing hair by keeping one styled curly and the other one straight.